Mesa County Administrative Offices will be closed on Monday, May 26th in honor of Memorial Day. This one-day closure includes the Health Department and Department of Human Services (510 29 1/2 Road); Clerk and Recorder, Public Works and Planning (200 S. Spruce Street); Regional Transportation Planning Office (525 S. Sixth Street); and all the offices at the Old Courthouse (544 Rood Avenue) such as the Treasurer and Assessor. This applies to all Clerk and Recorder branch offices as well. The closure also includes the Sheriff’s Office Records and Civil Divisions. The closure does NOT include the Sheriff's Office Jail or Patrol Divisions, Criminal Justice Services or Mesa County Animal Services. Please visit us again when these offices re-open to the public on Tuesday, May 27th. GRAND JUNCTION, COLO May. 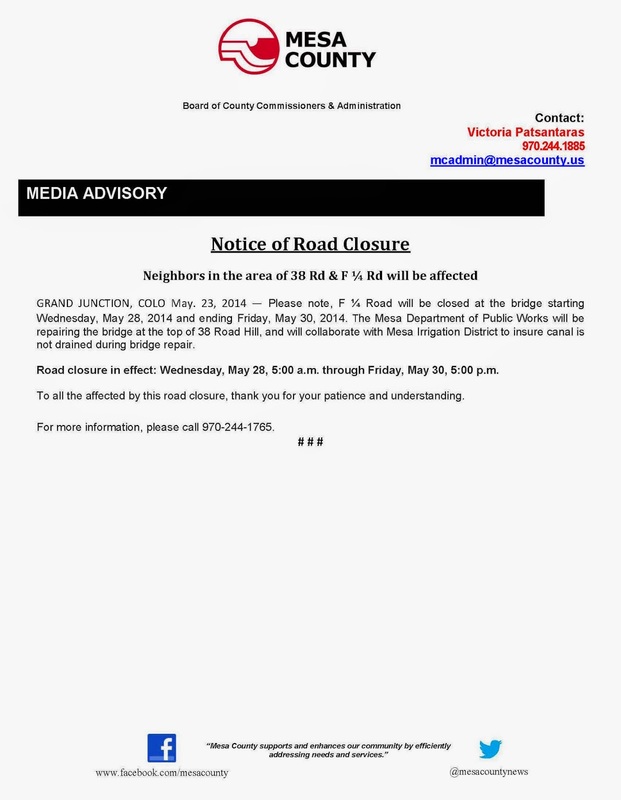 23, 2014 — Please note, F ¼ Road will be closed at the bridge starting Wednesday, May 28, 2014 and ending Friday, May 30, 2014. The Mesa Department of Public Works will be repairing the bridge at the top of 38 Road Hill, and will collaborate with Mesa Irrigation District to insure canal is not drained during bridge repair. Road closure in effect: Wednesday, May 28, 5:00 a.m. through Friday, May 30, 5:00 p.m.
To all the affected by this road closure, thank you for your patience and understanding. For more information, please call 970-244-1765. The Mesa County Commissioners learned that Governor Hickenlooper is considering taking action relative to proposed oil and gas ballot measures, and that negotiations may be occurring relative to a draft bill for a legislative special session. In response, the Commissioners prepared a formal comment letter. COGCC (Colorado Oil and Gas Conservation Commission) is a division of the Colorado Division of Natural Resources. All interested persons in Mesa County are invited to help set future transportation priorities as part of the Grand Valley 2040 Regional Transportation Plan ("2040 RTP"). The 2040 RTP will help guide investments in the region's transportation system to reduce congestion, ease commutes, improve roadway safety, enhance sidewalks, bike, and multi-use trails, and maintain an efficient and effective transportation system that supports the regional economy. Like us on Facebook at Facebook.com/GV2040RTP. 5 - 7 p.m. at the Grand Valley Transit Operations Center, 525 South 6th St, 2nd Floor in Grand Junction. Participate in CDOT’s Telephone Town Hall on June 26th. Stop by, say hello at the 2040 RTP booth during farmer’s markets and community events around the region this summer. This 2040 RTP is the long-range transportation plan for the Grand Valley region and, although it covers all of Mesa County, it is not a county process or document. The 2040 RTP includes all communities and areas of Mesa County and is a product of the Grand Valley Metropolitan Planning Organization. The Regional Transportation Plan is required by federal regulations and is critical for the region to assess, prioritize, and fund transportation improvements. For more information, please call Ken Simms, Project Manager, at 244-1830 or visit the plan website at www.GV2040RTP.org. Last week, Mesa County Commissioners submitted formal comments to the BLM Field Office in Silt, Colorado, concerning 65 leases that the BLM has indicated it plans to review, approximately half of which are in Mesa County. In the event the BLM elects to move forward on the process, Mesa County requested “cooperating agency status”, a formal relationship whereby Mesa County is better able to monitor BLM action. A Proclamation was presented by Mesa County Commissioners designating June 7-15, 2014 as NeighborWorks® Week, urging all citizens to participate in the activities planned by Housing Resources of Western Colorado. Check out http://www.housingresourceswc.org/volunteer.html for further information. Mesa County Commissioners presented a Proclamation designating May 18 - 24, 2014 as Emergency Medical Services Week, recognizing the value, accomplishments, knowledge and skills of Emergency Medical Services providers that benefit the citizens of Mesa County. Today during an Administrative Public Hearing, Mesa County Commissioners approved a $2.2 million dollar contract with Ford Construction Company for construction of the Grand Valley Transit (GVT) West Transfer Facility at 612 24 1/2 Road in Grand Junction. This facility will include a Park and Ride lot and bus transfer facility connecting people and services to places outside the region along with making north-south/east-west connections within the Grand Valley. Construction will start in the spring of 2014 and scheduled to open January 2015. Funding for this project included: FTA - $2,1213,431; CDOT's 'FASTER' - $800,000; GVT Local Intergovernmental Agreement - $200,000. The Colorado Department of Transportation will begin a repair project on eight bridges in Mesa and Garfield counties beginning Monday, May 19th. Crews will begin with two bridges on the east end of Grand Junction, near Clifton at mile marker 12.83, following with work on the bridge at mile marker 10.08 near the I.70 Business Loop. Nighttime hours will be Sunday through Thursday from 7PM to 7AM and daytime hours will be Monday through Friday from 7AM to 5PM. Traffic will be reduced to one lane on the side of the bridge that is being worked and the speed limit will be reduced throughout the project.